The Minuets are the most complex and personal of the pieces on the disc. …Of particular note are the toccata-like, almost Bachian gestures in the Second and Sixth Minuets, along with the uncharacteristically chromatic, flirtatious subject of the third. The Danse Polonaise is surprisingly dark, full of bold, tumultuous arpeggios and almost operatic melody lines. The central trio features the military dotted rhythms of a traditional polonaise. …Kostritsa’s work in collecting these dances is commendable, as is his approach. In the Polonaises, his straightforward playing captures well the simple phrasing, form, and rather nondescript melody. …these works are pleasing. The stunningly beautiful Maria Szymanowska captured the hearts of many, both with her charm and keyboard skills that gave rise to a catalogue of solo works. Born in Poland in 1789 to financially well-placed parents, Marianna Wołowska’s gifts at the keyboard were manifold as a child, and after becoming a sensation in the Warsaw salons, she was sent to Paris to broaden her horizons both musically and personally. Her subsequent marriage to the wealthy Józef Szymanowski, was to prove a failure, and she returned to the life of a touring performer under her married name. It was a particularly arduous tour in 1831 that took her to St. Petersburg where she caught cholera and died at the age of forty-one. Her output of pretty dances included Twenty-four Mazurkas that were mostly aimed at the talented amateur, her style generally derived from Mozart, and their content a simple and pleasing tune that often lasts, quite literally, only a few seconds, and often ends in mid-air. They have no link with Chopin’s Mazurkas that were yet to come, the most extended track on the disc forming the finale of the Eighteen Dances, and is a Cotillon that lasts seven minutes. The Moscow-born pianist, Alexander Kostritsa, has little material of substance to work with, and if he had tried to add any personal touches—and that would have been difficult—he would, no doubt, be accused of tampering. The recording made last year in Cleveland, USA, is bright, clear, and does not make us aware that he is playing a restored period Steinway piano that would link the performances back in time. The history of the Mazurka demands a major essay or dissertation in its own right. However a few notes about this well-known form may be of interest. The Mazurka is one of the traditional national dances of Poland dating back to the sixteenth century and hailing from the Mazovia region which is near Warsaw. It was originally sung as well as danced. During the late-eighteenth and early-nineteenth centuries its influence spread from Poland into Germany, France and the United Kingdom. Formally, the mazurka can be defined as a dance in two or four sections, in triple time (3/4 or 3/8) with the accent on the second or third beat. The best known examples are the published 58 – plus a number in manuscript or lost – composed by Frederyk Chopin. He developed these dances, introduced other types of folk material and presented them in a variety of moods: serious, fiery, thoughtful and even playful. Chopin’s Mazurkas were often improvisatory in style and make use of small phrases building up into much larger sections. They epitomise the form. In the twentieth century the mazurka was developed further by Szymanowski who succeeded in combining the structure of Chopin’s examples with contemporary harmonic and rhythmic devices. 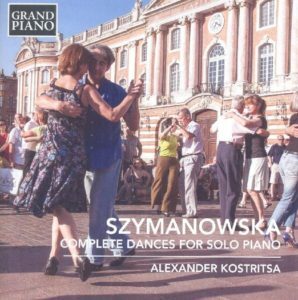 The most interesting aspect of this CD is the 24 mazurkas by Maria Szymanowska. The notes remind the listener that she was one of the first ‘professional virtuoso pianists of the 19th century.’ Szymanowska was born Marianna Agata Wołowska in Warsaw in 1789: the story of her early musical studies remains something of a mystery. Between 1815 and 1828 she toured throughout Europe giving both public and private recitals. In England, Szymanowska appeared at Royal Philharmonic concerts and at Hanover Square. She maintained a salon in St Petersburg and gave lessons, as well as composing music for the Tsarina’s court. She had many influential friends including John Field, Luigi Cherubini, Johann Hummel and Johann Wolfgang von Goethe. This latter is reputed, on inconclusive evidence, to have been madly in love with her. Szymanowska died in St Petersburg in 1831 during a major cholera epidemic. Maria Szymanowska’s reputation as a composer relies on a number of ‘small-scale’ piano works including nocturnes, studies and the present mazurkas. Scholars are divided as to her impact on the music of Chopin. However, the important thing is that these examples are amongst the earliest attempts at writing ‘concert’ versions of these dances. I found them charming and delightful pieces: in spite of lacking the subtlety of Chopin’s contribution they are valuable examples of the form. Little needs be said about Chopin and his Mazurkas, They are well-known, well-loved and represent a synthesis of the Polish folk dance music that has never been excelled. The present selection from op.7 and op.17 are from the composer’s early period and were written some time between 1830 and 1834. Karol Szymanowski is not a composer that I have explored in any depth. He is usually regarded as the ‘most celebrated Polish composer of the early 20th century’. The booklet points out that his musical style is often divided into three periods. Firstly, he came under the spell of Romantic German composer as well as the early works of the Russian Scriabin. This was followed by an exploration of impressionism and a more atonal palette of musical colour. Finally, he reverted to a more traditional harmonic style fused with an appreciation of Polish folk-music. 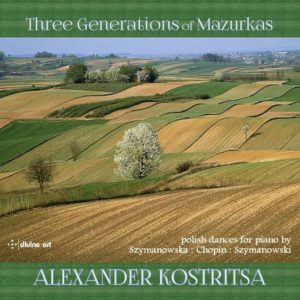 The present collection of Mazurkas, op.50 was composed between 1924-25. In this subtle music the composer is clearly exploring new possibilities in piano style. He is providing a combination of his mature pianistic style with that of Polish folk music as well as entering into a dialogue with his predecessor, Frederic Chopin. The pianist Alexander Kostritsa was born into a musical family in Moscow. He began studying the piano aged six. Only two years later he made a concert tour in Japan, as a prodigy. When Kostritsa was nine he was accepted into the Gnessin School of Music. Subsequent studies included his Master of Music degree from the Moscow Tchaikovsky Conservatoire where his teachers included the pianist Mikhail Petukhov. He was awarded his DMA degree at the Cleveland Institute of Music where he studied with the Italian-American pianist Antonio Pompa-Baldi, He has toured extensively in Europe, the United States and South Korea. Alexander Kostritsa won first prizes in the Rovere d’Oro competition (Italy, 2007) and at the Slavonic Music Festival (Ukraine, 2007). Any method of listening to this CD involves selections of both composer and item. It would be hard work listening to 43 mazurkas back to back no matter how good the pianist or how renowned the composer. I approached each composer’s contribution with very good rests in between. I enjoyed Kostritsa’s playing. It is beyond my ken to evaluate these performances against the many dozens of pianists who have recorded the Chopin works. Clearly Kostritsa is not Rubinstein or Horowitz but responds well to the challenges of these popular numbers. Szymanowski is less-well represented on CD: Marc-André Hamelin on Hyperion is the leading challenger. Kostritsa presents this music with considerable imagination. I have nothing to compare in relation to Maria Szymanowska but I enjoyed the pianist’s interpretation of these delightful numbers.